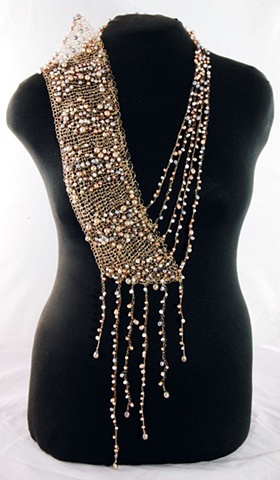 This asymmetrical neckpiece is both knit and crocheted using fine silver wire entwined with freshwater pearls in opalescent shades of cream, rose, gray, and bronze. The knit panel was first constructed, and then the center front and side crocheted chains added. This neckpiece is finished with a five-stranded, sterling silver slide clasp.